Woddles/Tilly - Diamond in the Ruff Rescue & Rehab, Inc.
Woddles is a 7-year-old miniature dachshund who came to us, when her owner was battling terminal cancer, with her entire family: her mate, Charlie (a standard dachshund), and her daughters, Maggie, Ginger, and Dutchess. Woddles and her family had spent the past year living in a single room with no exercise, so they all had bad teeth and extremely long nails. Woddles and her daughters all needed extensive dental work, racking up a bill that was over $800! Woddles was the worst off, requiring seven teeth to be extracted. One tooth had rotted all the way into her nasal cavity! The hole left by the rotting tooth kept accumulating food, and required constant cleaning and many months to heal. Most likely due to her age, she was the only member of her family that wasn't adopted out in the first two months of being admitted into the rescue. Woddles is an amazing dog, content to slumber on the couch or in your lap, and takes better walks off leash than on leash. She is very loveable, and wants to "wash" your face whenever you pick her up. 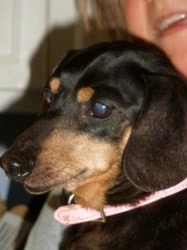 Woddles found her forever home May 2010 and was renamed Tilly. She was pampered and was the queen. Unfortunately, most likely due to the extreme humidity of this particular summer, her previously undiagnosed congenital heart failure started bothering her, and it became harder and harder for her to breathe. Her owners took her to an emergency vet, but there was nothing they could do to fix the situation, except to keep her in an oxygen tank for a while and hope that would get better. Her owners waited a few weeks to see if it might get better, but it never did. They then made the extremely hard decision to humanely euthanize her so that she did not have to suffer. Woddles/Tilly is sorely missed by everyone who knew her.